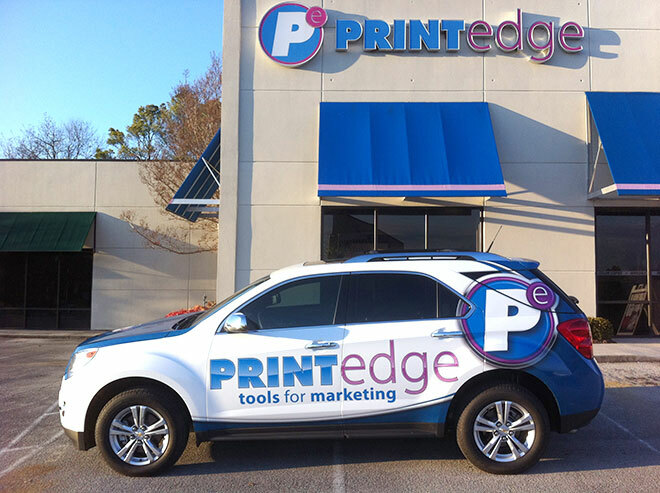 Printedge is Knoxville's go-to destination for Vehicle Wraps & Vehicle Graphics! Get more from the investment you made in your company vehicle by turning it into a traveling billboard for your business! Big or small, we can wrap your company van, car or truck with a custom and durable full-color vehicle graphic that will turn heads and generate leads. Whether you have a fleet or just one company car, vehicle graphics are a great way to market your business and provide credibility with your customers. Vehicle graphics are surprisingly affordable, especially if you consider the one time cost versus the number of impressions you make with those who see your vehicle. And full color logos and art are sure to get noticed and remembered more often than standard lettering. We use high performance vinyl materials that resist fading and cracking for several years. No amount of detergents or power washing should destroy our vehicle wraps. Our capabilities are limited by our collective imaginations. Contact us today to learn more about this fantastic and cost-effective way to advertise your business. We're proud to put our name behind every vehicle wrap we do, and we promise you won't be disappointed with the results!